Sunday, March 29, 2015, The DC Environmental Film Festival closed with the film “Racing Extinction”, by Louie Psihoyos (“The Cove”, Aug. 7, 2009). The essential theme of the 90-minute documentary is that climate change is combining with over-fishing and over-hunting to threaten half of the species on Earth with extinction. Take a moment to interpret the title of the film, literally. The film pays a lot of attention particularly to over-fishing of manta rays near Indonesia, and documents the economic change of the island economy from fishing to ocean tourism. It also shows the results of “shark fin” gathering for shark fin soup, with sharks falling to the ocean floor after amputation of fins. We don’t live in a world of “free fish”. It also documents the demise of some bird species, as a particular sparrow in Florida sings the last male song. It encourages people to go vegan and to stop eating animal products. It claims that the cattle industry causes enormous methane release. It also presents Elon Musk and his electric car, the Tesla. The film, however spectacular (with its photography of impoverished coastal areas of Indonesia) tends to be a bit disorganized and “all over the map” in building its arguments. The film also showed holographic projections of animal extinction scenes in New York City and Washington, as against the UN buildings. I’m used to pondering the moral arguments concerning animal extinction more for animals closer to humans in self-awareness and sensitivity: that is, carnivores (big cats), primates, cetaceans, and certain other animals like elephants. Yet, the film did not get into fur poaching, for example, as much as have some other documentaries in the same festival. The planet, however, depends on the health of everything, especially in the ocean. We destroy algae and plankton in the ocean, the planet could lose its ability to produce oxygen. Acidic oceans dissolve the shells of many mollusks and other animals. And what really did happen to Venus? Is that a lesson for us? After the film, there was a lengthy QA, followed by a reception with delicious vegan (if spicy) hors d’oeuvres, at the Carnegie Science Center in Washington DC. The official site is here. The film will be presented on cable by the Discovery Channel and in theaters, apparently by Sundance Selects. The production group is the Ocean Preservation Society. The QA made several points. One idea is that the Internet makes information about conservation spread much more rapidly among the public. Another is that people should be encouraged to go all electric with cars (not even hybrid), and that the racing community embraces that. Of course, the whole country and western world needs an infrastructure of efficient charging stations before that's practical for most people. Another was the idea that the producers want to “start a movement”, not just make movies! 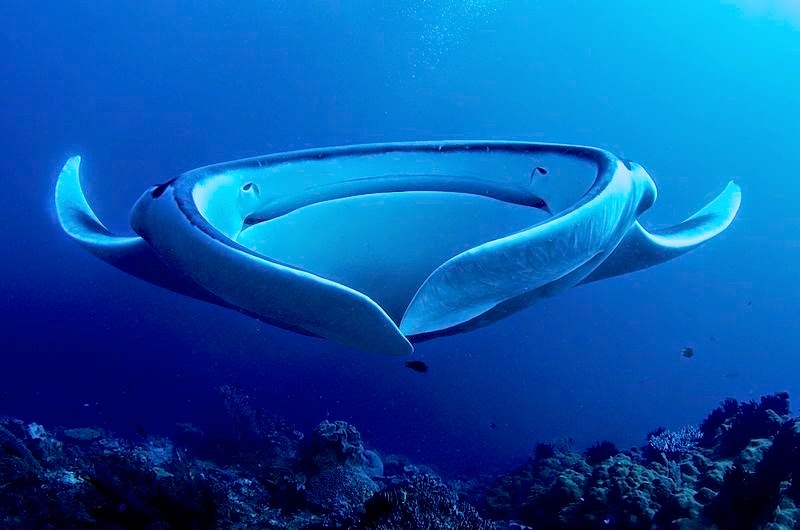 Wikipedia attribution link for Manta Ray picture by Arturo de Frias Marques, under Creative Commons 4.0 International license.